This was a nice change to having pasta not completely laden in a heavy red or white sauce. Not that I don’t COMPLETELY enjoy eating pasta thickly covered in sauce, but you know what I mean, this was something different. However, if you know me, you know I hate change. Okay, I’ll stop there. Anyway, for the few simple ingredients here, it was great, with a nice flavor. It was lovely with a chilled glass of white wine and some crusty bread. A quick and satisfying dinner. Now for the kids, they had their ravioli with red sauce. My older son, who loves peas, wasn’t quite ready to accept peas and pasta as the perfect match. He doesn’t know what he is missing. So if you need to change up your pasta repertoire, give this one a shot. Cook the ravioli according to the package directions. Reserve 1/2 cup of the cooking water, then drain the ravioli. Meanwhile, heat the butter in a large skillet over medium heat. Add the shallots and cook, stirring occasionally, until soft, 2 to 3 minutes. Add the peas, lemon zest, reserved ravioli water, 1/2 teaspoon salt and 1/4 teaspoon pepper. Cook, partially covered, until the peas are heated through, 3 to 4 minutes. Divide the ravioli among bowls and top with the pea mixture. Don’t know and cant understand y but my children hate peas. Me, on the other hand, I love them. This looks fabulous! Why do peas (and beets and brussels sprouts, for that matter) get a bad rep?? These look great! And I like the lightness of it.. Very interesting dish, and fantastic presentation. However, no peas for us in this family. My husband will not touch peas, and I prefer the red sauce anyway. You know how people get in a “rut”….well, you might say we are in a “rut”. As soon as I saw peas and shallots, I had to click through. I love pasta and peas. A little bit of olive oil would kick up the flavors though and adding in some thyme or basil (or mint) is really nice with the peas too. I cook peas every single week. It’s like I can’t be out of peas the way I can’t be out of milk. 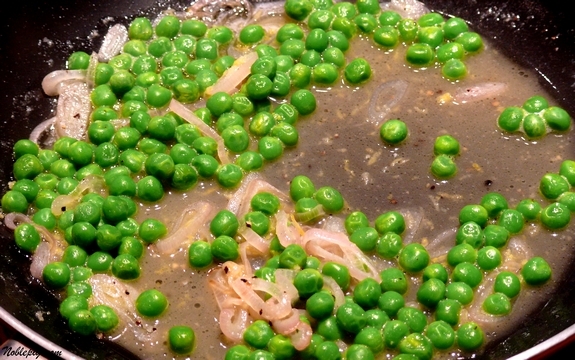 Peas, onion, olive oil and ground beef is a staple as a quick meal. It’s an old Italian thing. And, fresh parm cheese doesn’t hurt it either. This does look different, but delicious! That is the fun part of cooking, finding something different to make and share. I can count on you to offered these kinds of recipes. Thanks. I love peas with pasta. TOG says I’m a little odd that way… but yum! And this looks great! I’d love it but there’s no way on God’s green earth I could get the big guy to eat peas. Oh well! This is exactly the kind of pasta dish I like to whip up for a quick dinner. It looks lovely! This looks so good and it is very quick. Something that I need on most nights. This does look delicious. I’m trying to lighten up my menu also and this is a nice change. I might be joining your son because of the peas too. 😉 I like the idea though. The shallots and lemon zest are a nice simply tasty flavor combination adn would work well with a of different vegetables. Lightly dressed pastas are more authentically Italian than heavily sauced ones. A simple recipe that looks so gourmet. YUM! This looks wonderful. I adore peas with pasta. I am over my picky stage… i would jump on this! You mean your picky eater didn’t snivel about the peas? You do remember the card my son brought me for Thanksgiving, right? This looks great, with or without peas. Oh! 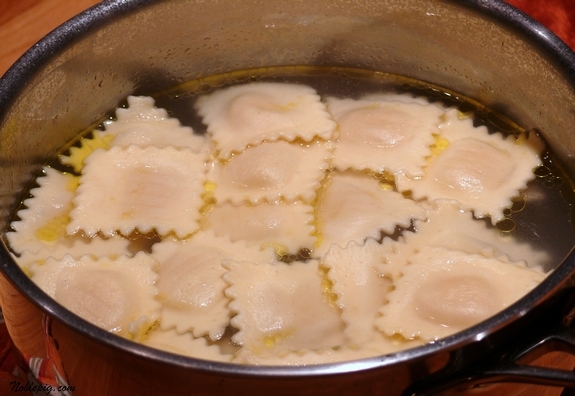 What a nice ravioli, lovely pictures 🙂 Would like to have a big bite of it…yummie! What a great idea! Simple and delicious. I love this dish…looks very delicious. But I think I have to omit the peas cos my children won’t eat them. I don’t understand why I fall off your RSS Feed list. It’s happened twice. Once around Thanksgiving and again now. The last post I received was the Carolina BBQ sauce and then I just read about those egg sandwiches over at Year on The Grill and sure enough I pop over and have missed several. ANYWAY, Cathy, there are not enough meals to cook all of the recipes I’ve saved from your blog! This looks wonderful! Thanks for all of these great recipes. Looks delicious. I love pasta and sounds like a nice change from the usual sauces. I love peas. And shallots. And yum .. . ravioli. All together and this sounds excellent! I love it, so much lighter and perfect for Sunday lunch! I love the simplicity of this dish, plus I love peas, so I could really go for a large serving of this pasta! Girl, I don’t like peas but you sure make them look extra appetizing in this dish, especially since I just love me some ravioli! Great looking dish. colors and all! I’m so funny when it comes to peas. I like pea soup, pea salad, raw peas, pea dip, etc., but I don’t like cooked peas. Since the little green rounds are paired here with pasta, I might just give them a go. They certainly look pretty. Glad I’m not the only one who serves the kidlin’s “their style” of pasta! 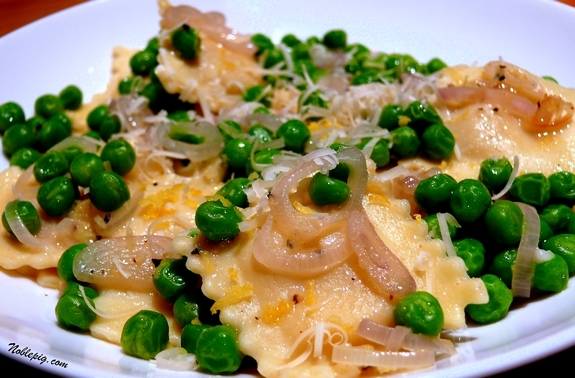 I do love peas with pasta, and the shallots and lemon zest sound great here too. This would be just a perfect dinner for my daughter and me tomorrow night! Delicious! Mmmm, mmmm! This is a winning combination for me! Aside from the shallots, I think my kids might eat this. 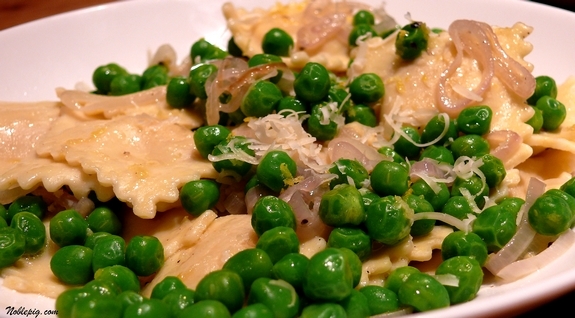 But then again, even though they love peas and they love ravioli, I know what happens when you combine…lol! This looks really delicious! I have a similar recipe with Bacon, angel hair and peas. I’ll have to “mix it up” and use the ravioli next time! Beautiful. At this time of year, I’m so ready for a break from the traditional tomato sauce. This will be a nice addition to our dinners next week. outstanding photography, i am a new fan! This was a great recipe and like you said, was a good alternative to the heavier sauces of the world. Delicious!